‘a philosophy called naturalism or materialism or physicalism or simply modernism. Under any of those names this philosophy assumes that in the beginning were the fundamental particles that compose matter, energy and the impersonal laws of physics. To put it negatively, there was no personal God who created the cosmos and governs it as an act of free will. If God exists at all, he acts only through inviolable laws of nature and adds nothing to them. In consequences, all the creating had to be done by the laws and the particles, which is to say by some combination of random chance and lawlike regularity.’ (p. 13). This contrasts with the common image of scientists being objective and impartial analysts who allow the empirical facts to speak for themselves. Quite the contrary, if chance plus immutable natural laws must be capable of explaining all reality, then absurd explanations become acceptable given the lack of a better alternative within the permissible possibilities. ‘In my mind the most important thing is to get people to ask the right question, not to try to tell them how to answer the questions. … For example, any person who is willing to focus on the problem of genetic information, to understand what it is and how it may be created, is on the right track whether or not he or she is ready to give up on the prospect of a naturalistic solution to the problem’ (p. 16). ‘Science’, in the strong sense, deals with repeatable events under precisely controlled conditions, and these testable results are to be valid across time, location and experimenter. Although all conclusions should still be treated as tentative descriptive models, even incomplete understanding can lead to advances in technology and medicine. Christians certainly approve of this form of knowledge acquisition, when applied in beneficial ways not contrary to God’s commandments. However, scientific methodologies available to interpret historical and geological events are, unfortunately, far less reliable. Hard-core science, which allows us to send astronauts to the moon and to build bridges many kilometres long, cannot provide answers to many important human problems. ‘First, science at best gives us only factual or instrumental knowledge, not knowledge of ultimate purposes. From science we may learn a great deal about how the world works, and how to get whatever it is that we want, but unless we have another source of knowledge we will have no way to reason about the purpose of life or exactly what it is that a rational person ought to want.’ (p. 37). The materialist wishes to speak with authority, with the kind of credibility we reserve for empirical, repeatable research conclusions. He is forced to the conclusion that intelligence is derived from the properties of inanimate matter and that the existence of sentient beings just happened. Are such scientists equipped to answer the deepest issues which trouble us? Why should my personal worth and value be greater than that of a virus, which isn’t even truly living? Do my thoughts accurately reflect an external reality? Does death end it all? Are good and evil merely arbitrary concepts of transient definition? Do I really have a free will? Will I be held accountable by God some day for my actions? The answers the materialist offers to these most important of questions are based on unverifiable and self-serving assumptions. The conclusions follow the unjustified premises and nothing more. ‘By information I mean a message that conveys meaning, such as a book of instructions’ (p. 42). ‘Information is not matter, although it is imprinted in matter’ (p.123). ‘Instructions in the fertilized egg control embryonic development from the beginning and direct it to a specific outcome. This "full and complete set of instructions" employs the material processes of chemistry and physics but is not created by those processes. Similarly, the software in a computer employs natural processes to generate a word processing document, but the software has to be written by an intelligent agent. The relevant question is not whether miracles are required once the instructions are in operation but whether intelligence was required to create the instructions in the first place’ (p. 134). For completeness, we should not overlook the fact that in addition to the coded, process-guiding instructions themselves, complex machinery is needed to both decode the messages received and then to act upon them. And in living organisms, this decoding machinery is itself encoded. Some people have fallen into a ‘god-of-the-gaps’ logical flaw. Whatever science appeared able to explain did not seem to require the intervention of God and one constantly sought examples which could not (yet) be explained. This is poor logic and we should never resort to miraculous intervention for operational science. But it is different for origin science. For example, upon finding a lock and key which work together we can describe the mechanics of operation but this hardly does away with the need for an intelligent agent who designed both to work together. Professor Gitt6–8 has explained the use and characteristics of coded messages, which can be used only if the necessary decoding apparatus is also available for the receiving party. The receiver can be inanimate, such an engineering control system, or intelligent, such as a reasoning person. The purpose of these messages is to guide physical change (non-intelligent receiver) or to provide insight (intelligent receiver) and thus bridge gaps over time or location. Such coded information systems can only arise by intelligent agency. In keeping with his intention, Johnson asks us to pose the right questions. Where does genetic information come from? Life would be inconceivable if all the necessary repair and replication mechanisms biological organisms need were not genetically provided for. And there are many biological functions today that the evolutionary model must claim did not exist in the remote past: eyesight, sonar, flight, muscle, sexual reproduction, motors, gecko’s ‘sticky’ feet, etc. These functions require a multitude of unique genes not found in ‘primitive bacteria’. Many biological processes can only function once all the individual parts are in place concurrently, a phenomenon professor Behe9,10 describes as ‘irreducibly complex’. Irreducibly complex processes require a large number of proteins at the same time, where there would be no Darwinist selection advantage for any individual polypeptide, only the completed ensemble. ‘Textbooks typically define evolution not as information-creation but merely as change—either "change over time" or "change in gene frequencies"’ (p. 43). ‘When a mutation makes a bacterium resistant to antibiotics, for example, it does so by disabling its capacity to metabolize a certain chemical. There is a net loss of information and of fitness in a general sense, but there is a gain in fitness in specific toxin-filled environments’ (p. 46). This is a point which Dr Lee Spetner11 has analysed in depth. ‘One convenient way of expressing this distinction is to say that the standard examples of micro-evolution are all of horizontal evolution, while the grand creative process should be called vertical evolution’ (p. 128). ‘Variation and diversification occur, probably to a greater extent in the remote past than in the present, but only within the confines of the basic type’ (p. 132). In chapter 3, Johnson discusses the decision by the 10-member Kansas board of education in 1999 to allow a more balanced treatment of how evolutionary ideas and their alternatives can be presented at the pre-college levels. One could hardly fail to notice the almost hysterical, even panicky reaction nation-wide on the part of the established materialist camp. What exactly could evoke such a reaction? Johnson describes some of the guilty sentences. ‘Whereas the drafting committee had defined science as the human activity of seeking natural explanations, the board substituted that "science is the human activity of seeking logical explanations for what we observe in the world around us"’ (p. 68). ‘Natural selection can maintain or deplete genetic variation but does not add new information to the existing genetic code’ (p. 69). ‘Understand that natural selection acts only on the existing genetic code and adds no new genetic information’ (p. 69). ‘A Gallup poll conducted in late June 1999 revealed that Americans favor teaching creationism in public schools along with evolution by 69 percent to 29 percent. They also oppose by 55 percent to 40 percent replacing evolution altogether with creationism, a margin that I am sure the science educators do not find very reassuring’ (p. 78). The objective issue is simply whether one particular evolutionary viewpoint, Darwinism, should be presented as fact, and which tolerates neither scepticism nor competition; or whether ‘sometimes the authority of "science" is used to validate claims that are based largely on speculation’ (p. 70). ‘Is the "evolution" that biologists observe merely a matter of variation within preexisting species or types, or is it a genuine creative process that over time can produce new complex organs and new kinds of organism?’ (p. 72). The materialist Überreaktion to the possibility of open and candid discourse exposed their intellectual insecurities. The mass media shamelessly distorted the real issues by replacing the word Darwinism by science and pretending modern research and technology were under attack. ‘For example, Scientific American editor-in-chief John Rennie urged scientists on university admissions committees to notify the Kansas governor and the state board of education that "in light of the newly lowered education standards in Kansas, the qualifications of any students applying from that state in the future will have to be considered very carefully"’ (p. 80). Johnson challenges us to ask the right questions. One might be, whether any useful biological insights or explanation can be credited to materialism at all. In my experience, whenever the same gene is found to be almost 100% identical across all or most organisms, the cell biology textbooks call them ‘highly conserved’ or ‘highly conserved in evolution’. Are we any wiser through such post-facto rationalizations? Or does this merely camouflage the obvious question: if there has been virtually no change in the alleged couple of billion years for all organisms where this gene is found, then presumably there is no room for variation for the resulting protein. Close is not good enough and apparently renders the owner unviable. Well now, how did the precise base-pair sequence arise by chance in the first place!? The intermediates would be worthless, interfere with other biochemical processes, and waste both energy and building material. As Walter ReMine points out so clearly,14,15 the evolutionist has a seemingly endless smorgasbord of stories which can be used post-facto. If organisms not related by a phylogenic evolutionary tree show dramatically similar features one reads this is due to ‘evolutionary convergence’. However, if organisms in very similar environments fail to display apparent similarities, convergence had not occurred. Such rationalizations are free of substance and an inadequate substitute for hard evidence. One might ask who has such intense vested interests in excluding the possibility of the existence of a creative God from all discussion. ‘In 1996 historian Edward Larson and journalist Larry Witham repeated Leuba’s survey of scientists … The first results were nearly identical to those in Leuba’s 1914 survey: 40 percent of scientists-in-general still say they believe in a prayer-answering God and in personal immortality’ (p.85). ‘But in 1998 Larson and Witham repeated the survey for elite scientists, defined specifically (since the directory no longer gives stars to the greater scientists) as those who have been elected to membership in the National Academy of Sciences … Disbelief in supernatural theism among Academy members was over 90 percent, and for biologists it was 95 percent’ (p. 86). Ernst Mayr surveyed his own Harvard colleagues about their beliefs: ‘"It turned out we were all atheists", he recalls’ (p. 86). Peer-reviews for promotion and publication are dominated by the leading members of a scientific community. So are key positions as department heads and on editorial boards. Furthermore, there is a form of selection based on mentor relationships. A bright biology candidate with Christian convictions would consider carefully whether Harvard meets his or her needs. And an outspoken creationist is going to have a very difficult time rising in the academic ranks within élite universities without the support of an influential figure, which we know will generally be an evolutionist. These high priests of modern thought apparently believe they have much to lose, both in terms of prestige and financial reward, if their ‘explanations’ should be discredited. In an attempt to defuse resistance on the part of the majority of Americans, of whom only 10% claim to be atheists, leading evolutionists such as Professors Gould and Dawkins offer some empty compromises. ‘Gould proposed a peace-making formula he called NOMA—non-overlapping magisteria’ (p. 95). ‘Whenever one party to a conflict proposes to settle it with a formula of "separate but equal", the other party had better look carefully to see who is going to draw the boundary and where it is going to be drawn’ (p. 96). ‘It is not merely a matter of letting a tiny bit of religion into a science-dominated world. If heaven really exists, then the authority to determine how to get to heaven is vastly more important than the authority to say how the mundane cosmos works, since the latter deals only with earthly knowledge that will soon pass away’ (p. 98). ‘Gould takes for granted that all such questions are within the magisterium of science’ (p. 98). ‘Behind the power play stands a philosophy that bars religion from claiming that there is a supernatural creator (much less one who was incarnated in Jesus), a divinely infused soul, a life after physical death or a source of divine revelation such as inspired Scripture’ (p.99). ‘For example, Richard Dawkins commented that science is compatible with religion if the latter means only feelings of awe at the wonders of the universe or the fundamental laws of physics’ (p.100). Christian beliefs are to be relegated to the realm of feelings with no basis in the real universe—a heavy price for peace with the materialist who claims to speak for science. Johnson makes clear this is unacceptable. ‘But a teaching authority cannot be based on subjective feelings, ungrounded speculation or empty words. If theologians are to teach, they must have a source of knowledge independent of that possessed by science. And if they are going to assert the existence of such a cognitive territory, they must be prepared to defend it’ (p.102). Let me add the obvious. In defining what science is, the materialist is not authorised to determine for the Christian the rules by which it may be practised. The goal is to discover and describe true causes and not deliberately exclude the possibility of intelligent agency. ‘They [the Darwinists] realise that it is safer to allow God a shadowy existence in human subjectivity than to run the risk that this very threatening presence will burst into objective reality. That is when we hear the standard vague reassurances that "many people believe in both God and evolution", or that "science does not say that God does not exist", or that "science and religion are separate realms"’ (p.141). ‘In that case it is equally unwise to ground morality on the dogma that there is a self that reasons and makes moral choices’ (p. 117). Where are desire, choice, or will of any kind supposed to have come from? ‘If in the beginning were the particles, chance and the laws of physics—and nothing else—then everything that has happened since must be the products of those fundamental causal factors’ (p.119). The very assumption that man has the capacity of coherent thought and his mind is able to correctly map an external reality to mental states has no metaphysical basis for the materialist. Thoughts and reasoning become a mathematical function of deterministic laws plus random chemical behaviour. ‘The irony is that eliminative materialism itself is fatal to science, since it implies that even the scientists are not really conscious and that their boasted rationality is really rationalization’ (p. 119). ‘Evolutionary science has made many attempts to explain religion in general, or Christianity in particular, on naturalistic assumptions. Now it is time to return the favor, by allowing theology to explain why science is so reliable in some ways, and so disappointing in others, and why Darwinian science in particular has come to such a dead end. The place to begin is … in the opening Gospel of John. "In the beginning was the Word, and the Word was with God, and the Word was God. He was in the beginning with God; all things were made through him, and without him was not anything made that was made" (Jn 1:1, RSV)’ (p.151). Since ‘what can be known about God is plain to [all people], because God has shown it to them … Romans 1:20-23’ (p. 153), the atheist must surround himself with those also wishing to exclude God from consideration. ‘The equally atheistic Sir Francis Crick warns in his autobiography that "biologists must constantly keep in mind that what they see was not designed, but rather evolved"’ (p. 153). Eventually, everyone must confront the question our Saviour himself asked: ‘"Who do men say that I am?" As long as naturalist reasoning governs all inquiry, Jesus’ question has little importance’ (p. 158). This book does not hide the author’s conviction that the Bible is God’s inspired message to guide human behaviour and thinking. Many would profit by posing the key questions: are the materialistic claims founded on anything more than arbitrary rules and speculations? Are the resulting conclusions consistent with what my heart and mind tell me? http://www.discovery.org/ (Discovery Institute). Return to text. 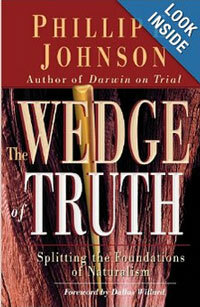 Johnson, P., Darwin on Trial, Regnery Gateway, Washington, DC, 1991. Return to text. Johnson, P., Defeating Darwinism by Opening Minds, InterVarsity Press, Downers Grove, Illinois, 1997. Return to text. Oard, M., Review of Defeating Darwinism, Journal of Creation 12(1):28–29, 1998. Return to text. Gitt, W., In the Beginning was Information, Christliche Literature-Verbreitung e.V., Bielefeld, 1997. Return to text. Truman, R., The problem of information for the theory of evolution: Has Dawkins really solved it? <http://www.trueorigin.org/dawkinfo.asp>; July 14, 1999. Return to text. Gitt, W., Information, Science and Biology, Journal of Creation 10(2):181–187, 1996. Currently being updated. Return to text. Behe, M.J., Darwin’s Black Box: the Biochemical Challenge to Evolution, A Touchstone Book, Simon & Schuster, New York, NY, 1996. Return to text. Ury, T.H., Review of Darwin’s Black Box, Journal of Creation 11(3):283–291, 1997. Return to text. Spetner, L., Not By Chance! 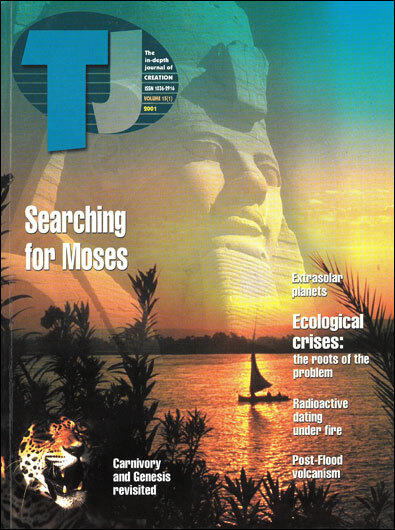 Shattering the Modern Theory of Evolution, The Judaica Press, Inc., Brooklyn, NY, 1997–8. See also review by Wieland, C., Creation 20(1):50–51, 1997. Dembski, William A., The Design Inference: Eliminating Chance Through Small Probabilities, Cambridge University Press, Cambridge, UK, 1998. Return to text. Truman, R., Divining design: A review of The Design Inference: Eliminating chance through small probabilities by William A. Dembski, Journal of Creation 13(2):34–39,1999. Return to text. ReMine, W.J., The Biotic Message: Evolution versus Message Theory, St. Paul Science, St. Paul, MN, 1993. Return to text. Batten, D., Review of The Biotic Message, Journal of Creation 11(3):292–298, 1997. Return to text.